The Movie > TimeLine Tracks sub-palette allows you to control the tracks for movie recording. The Edit button will activate which track to edit on the Timeline. All the categories under the Edit menu can be altered along their own track. By default ZBrush will open with the Camera Track, however when you activate any of the other buttons in this menu the Timeline will change to the Track of the selected button. An example would be to click on the Background button which will change the Timeline to the Background Track. This track would capture document changes like Background Color, Document Range, Document Rate, and etc. The Camera button will activate the camera track to edit all movements (Rotations, Scale of the tool, and movement across the document.) with the selected tool. By default ZBrush will capture all Tool and Subtool visibility on this track. This can be changed by unchecking the Subtool button in the Link Menu of Timeline Tracks. The Material button will activate the material track to capture all material changes along the Timeline. The Transparent button will activate the Transparent track that will allow the Transparent button to be turned off/on along the Timeline. The ZSphere button will activate the ZSphere track that will allow ZSphere Preview mode to be toggled on/off along the Timeline. The Layers button will activate the Layers track that will allow all Layers to be edited at simultaneous time along the Timeline. The Explode button will activate the Explode track that will allow the Xpose button to be toggled on/off along the Timeline. The Background button will activate the Background track that will allow the Document to be adjusted along the Timeline. The Tool button will be edited along the Camera track in the Timeline. This is because the Tool is Linked to the Camera track in the Link Menu of Timeline Tracks. Unpress Tool in the Link Menu if you do not wish the Tool to be edited along the Camera Track of the Timeline. The Perspective button will activate the Perspective track that will allow perspective to be toggled on/off along the Timeline. The Color button will activate the Color track that will allow the Color of selected tool to be adjusted along the Timeline. It is best not to Fill Object with any color when using this track. The Wireframes button will activate the Wireframe track that will allow the Wireframe to be adjusted along the Timeline. The Subtool button will activate the Subtool track that will allow the Subtool(s) to be toggled on/off along the Timeline. However the Subtool(s) track is linked to the Camera Track because of the Subtool button being activated in the Link Menu of Timeline Tracks. The Subdiv button will activate the Subdiv track that will allow the subdivision levels of a Tool to be adjusted along the Timeline. The Layer button will activate the Layer track of the selected layer to be adjusted along the Timeline. The most ideal way to work with a Layer in the Timeline would be to just click on the Layer you wish to work on in the Layers Sub-Palette of the selected tool. Once you click on any layer in the sub-palette the track will automatically change to that layer. The Contacts button will activate the Contacts track that will allow contact strength to be adjusted along the Timeline. The most ideal way to work with Contacts would be to assign the dots along the Timeline once all three contacts points have be assigned to the selected Subtool. When Contact points are being created you will notice that the Timeline will automatically change to Mesh Contacts. The Adjustments button will activate the Adjustments track that will allow the Adjustment settings in the Render>Adjustments Sub Palette to be adjusted along the Timeline. The Solo button will activate the Solo track that will allow the Solo button to be toggled on/off along the Timeline. The Floor button will activate the Floor track that will allow the Floor to be toggled on/off or change floor attributes in the Draw Palette along the Timeline. When Pressed the ColorBeat button will allow beat lines to be set along the Timeline to provide a visual aid when matching mesh movements to an audio track that was imported into the Timeline. To lay down ColorBeat markers you must first hold Shift and click on the Timeline marker below the Timeline that indicates the current position to play from and what is the current time of the Timeline. As ZBrush begins to play the loaded audio track you can lay down ColorBeat Markers by holding CTRL as you click on the Timeline. The ColorBeat will be set by the selected color in the Color Selector. As you can see from the image the lines that are red, blue, and yellow are ColorBeat markers for an audio track that has been imported into the Timeline. The ClearBeat button will clear all ColorBeat Markers along the Timeline. The Link button will indicate with Timeline tracks are linked together to be on the Camera Track. 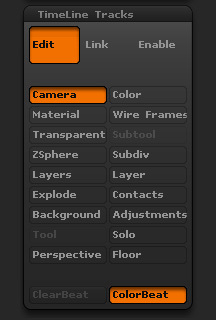 By default ZBrush has the Tool and Subtool linked to the Camera Track. The Enable button will establish which Tracks can be edited. If there are Tracks unpressed then you will not be able to activate that track to add dots for manipulation.